I saw this card from Vicki for the (new to me) AAA Cards sketch challenge and went in for a closer look. 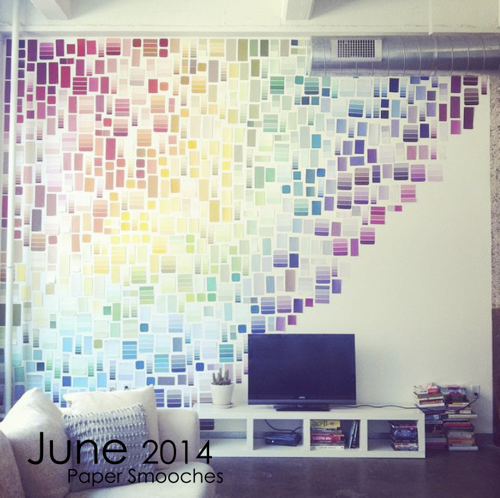 I also saw the inspiration photo from Paper Smooches Sparks. I think you might just see how my card was born! I sponged some Distress Inks through my stencil with my new (NBUS) Tim Holtz mini blending tool, stamped the sentiment using Paper Smooches Sentiment Sampler and mounted the piece onto some NBUS gunmetal grey card. I don't normally use coloured cardstock but I bought a pack at the last craft show I went to. Congratulations on reaching 500+ followers, Darnell, it's no surprise to us. Mwah! Beautiful card, love the vibrant & different colours over the stencil. Have a great day, Shirleyx ps.. still can't join your blog as a follower, strange but I have you on my blog roll. Gorgeous - looks just like the inspiration picture! Love your card Shirley which I saw on Darnell's challenge. I love the technique you used, the colors and the Paper Smooches sentiment. Shirley I love the card using the stencil and the touch of black is a great touch. I will case this card and put it in Pinterest. This is beautiful, your cards are stunning. I'm in awe of your designs. Absolutely love the mosaics! 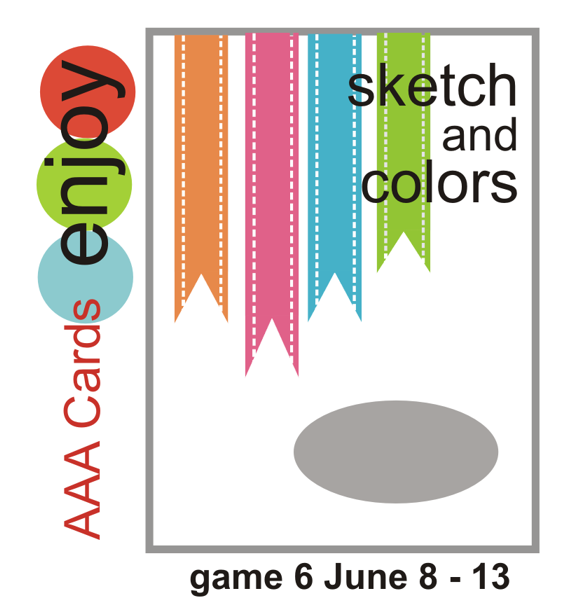 Such a great take on the AAA Cards sketch, thanks for playing. I love all the bright and cheery colors. What a fun card design and you certainly captured the style of Vicki too. She is super great I think as well. Your card is gorgeous, and your description of Darnell's endearing qualities absolutely bang-on! Thoughtful, heart-warming and funny, both of you! Unbelievably adorable! Love, love the way you made this mosaic look! Thanks so much for playing with AAA Cards. Please be sure to come back often!! Oh yeah - thanks for joining in at AAA too! LOVE this card. The vibrancy. I also have this stencil though bigger version I think. I love using it with bright colours. Love how you faded the colours out, sooooo clever. Your control and skill using color is so awe-inspiring, Shirley! I predict you absolutely have another winner here and well you should!! I also warrant that this is spreading throughout Pinterest as we speak. Oh, hey, more publicity for me! Thank you for linking up with my NBUS Challenge, ESPECIALLY with this extraordinary card!! Now, seriously, I'm not sure I can get to the exchange office tomorrow to get a UK money order, so I've opened an international paypal account to send you the amount we agreed upon. You more than adequately covered all the bullet points we agreed upon, altho I don't remember that bit about my foundation garments. Also I don't know what a Tena Lady is, so I'll go Google that. I imagine it must be something very regal having to do with Lord Tena. Okay, so off I go, you've given me lots of research to do and I'm short-handed with the hamster off mugging it up in Jollywood! Your card is just a fabulous piece of inspiration Shirley... and perfect not only for our challenge at AAA cards, but the others as well! Beautiful card, Shirley! 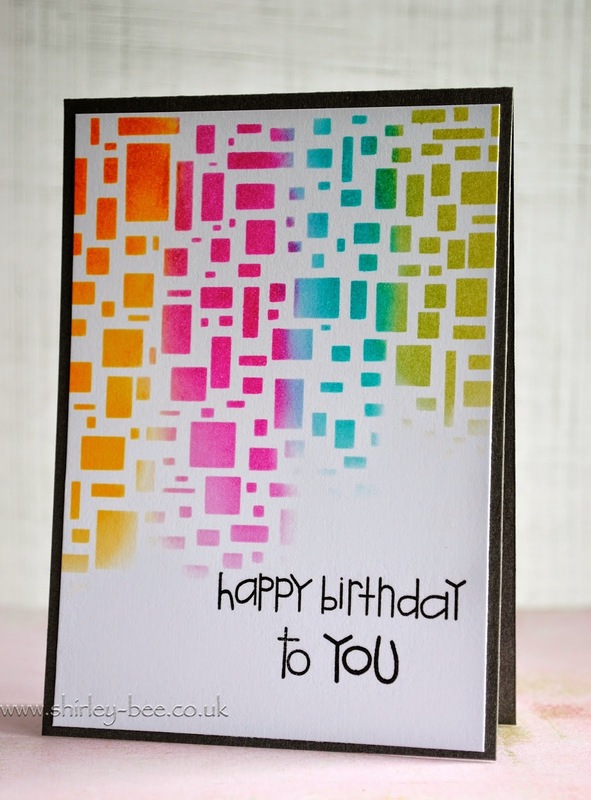 Love the happy colors and great to see it was inspired by Vicki's equally gorgeous card! Great stenciling :) love how you nailed all the challenges ! Beautiful card. Love your take on the AAA challenge-quite brilliant! Beautiful use of the stencil. Love it. WOW! Really awesome card, Shirley! I love how you were inspired to create your design, too...so graphic and fun! Fun, artsy, colorful, perfect for the challenge... winner material I'd say. Fabulous take on Darnell too:-) what's Tena Lady? Very artistic and colorful card Shiley. Like CAS as always. Oh I absolutely love this! The spectrum of color is fabulous. Thanks so much for playing with us at PaperSmooches Sparks! Love the look of the 'bits of confetti falling from the sky' and how one color rolls perfectly into the next! Nice bit of white space around the sentiment too! Great call with a black base - it sure makes the colors and the sentiment pop! This card is a show stopper!! I love the colors and the use of white space making for an eye popping design : ) WOW! What'd I predict?! Congrats on your shout out at AAA, girlie. I saw your card on the NBUS challenge and had to pop in to say hi an dget a closer look .i love the bright colours and designs its fab , I need to add that stencil to my wish list and the grey card makes it pop... good choice . What a FABULOUS card, so rich with color and design! I absolutely LOVE this creation! I love this. I love the mosaic pattern with those cheerful and bright colors. Thank you for sharing your card. Has this stencil been discontinued? I'm not having any luck finding it. It looks like it's still available - I've found it online in the UK, US, Netherlands, Poland. Search for The Crafter's Workshop Mini Cubist 6x6. Good luck! Thank you. With the help of a friend, I did finally find the stencil. For anyone else who might be looking for it, it is Mini Cubist, TCW248s, from The Crafters' Workshop. The Mini Cubist is 6 x 6; they also sell a 12 x 12 version.